In a sign of desperation at the Sebaana changing agenda, President Museveni's campaign scuttled original campaign plans and followed him to Luweero. Take a look at the miserly crowds in the picture. 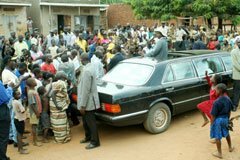 The crowds that turned out for Museveni were far smaller than those that welcomed Sebaana into Luweero this week. 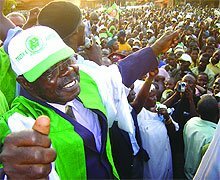 Museveni 2006 spent Shs 30 million on mobilization and Norbert Mao, Sebaana's campaign manager spent Shs 2.9 million on both the manifesto launch and the campaign launch in Luweero. The Museveni dollars which will run a high of $4.3 million this year have seen participants in campaign events demanding as much as Shs 100,000 for room and board. The question is whether these funds are coming out of the official coffers of NRMO which has still refused to release details of its accounts more than 1 year after being registered.